Easigrass lives up to its name! Time is in short supply and today’s homeowners live fast paced lives with little time for priorities like family and health and exercise. It comes as no surprise, then, that most don’t have time to mow lawns, let alone trim edges, water and feed them to ensure that they look ship shape all year round. Trigger Truniger, national accounts manager for Easigrass South Africa, says that the very many homeowners in South Africa with large gardens and rolling lawns usually find taming their jungles hardest. However, even those managing smaller gardens and town houses, find cutting and trimming their patches is far from easy. “That could mean missing out on rugby or braai time over weekends or having to mow when you’d rather enjoy a cool glass of wine after a hard day’s work. That’s never good for a guy or girl who spends most of the week driving a desk or hurrying from meeting to meeting,” Truniger jokes. On a more serious note, he explains that many home owners are trapped on the hamster wheel of lawn maintenance for all the right reasons – making sure that a property looks good, keeps its value and kerb appeal and that families and pets have safe and healthy places to play. The obvious answer is to simply call in a garden services company. But, that too, comes with its challenges including making sure that someone is at home to let them in, security issues and damage to plants and property. “The ideal is to find the perfect compromise which is what Easigrass offers,” he says. Nowadays, aesthetics is not an issue as sophisticated design creates artificial grass that closely resembles the real thing down to the brown strands in between the green blades of grass. 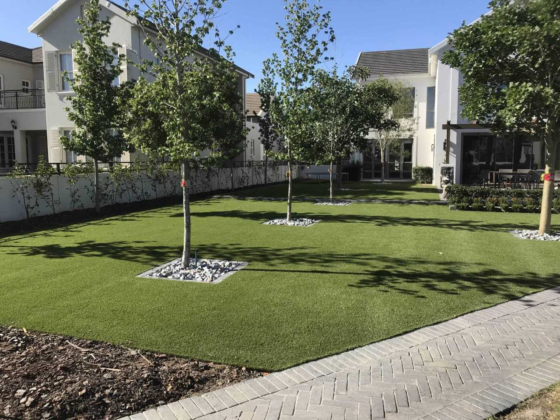 Easigrass South Africa, a division of Van Dyck Floors, has developed a range of nine artificial grasses that mimic the grass varieties most commonly found in local gardens. He points out that a brand with an international pedigree, like Easigrass, provides a long-lasting quality product that is guaranteed to live up to all its promises. “We use a geo textile weed barrier that also assists with stability as well as a premium crusher dust and silica sand infill that protects the backing of our grass from the elements and assists with cooling it once it has been lightly watered. It gives the home owner a real feel when walking on our grass and eliminates the crunching sound that has been traditionally associated with artificial grass. The recent introduction of new yarns and technology in the manufacturing process has created artificial turf that is more upright,” he explains. That probably explains why more and more estate and sectional title developments are now coming around to installing Easigrass.